This was a really cute story about Karen and her puppy that her dad gets for her. Only the puppy turns out to be a little terror, and in order to be able to keep him, they send Cody to boot camp so he can learn how to not chew things when he’s fearful. 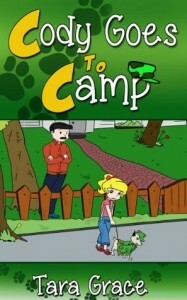 'Cody Goes to Camp' is a fun story that is complete with charming illustrations. It includes a valuable and enjoyable lesson for children about responsibility when it comes to having a puppy, and a means of training one for the better.